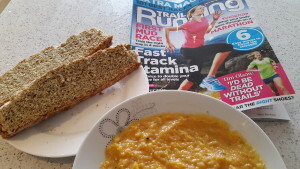 This gorgeous soup is adapted from one on Runners World. Quick and easy – give it a go! 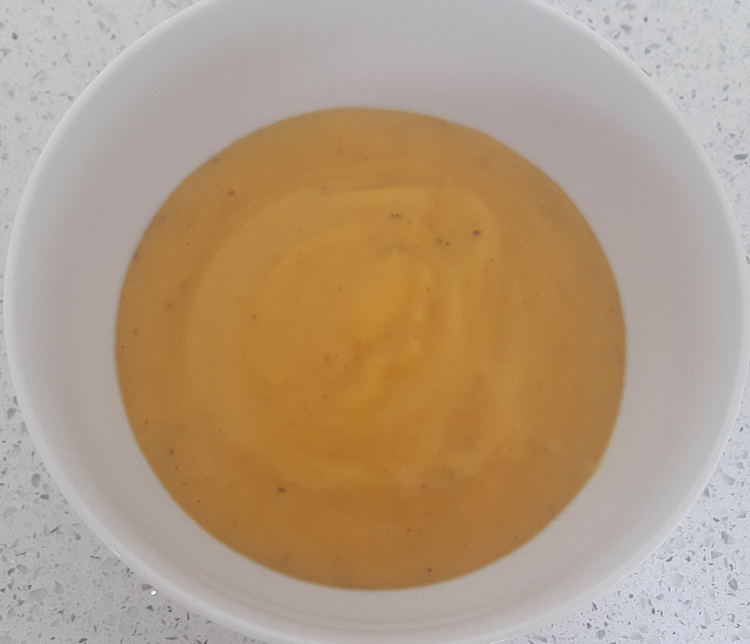 Steam butternut squash for 7-8 mins, until it is tender, yet still firm enough to hold its shape. Drain, place in blender and leave to cool (do not blend while hot). Make 180ml of chicken or vegetable stock – allow to cool before adding to blender. Add suggested quantities of curry powder, mixed herbs, sea salt to the butternut squash. Once cool, add stock to blender. Now blend for 20-40 seconds. Time depends on how chunky/smooth you want your soup. Serve in a nicer bowl than in this pic! Add a dab of bio yoghurt for effect and more benefit. Butternut squash is a great source of electrolytes for runners. Curry powder contains turmeric which has anti-inflammatory benefits, including reducing muscle pain and joint inflammation. Bio yoghurt will add further creaminess and delivers friendly bacteria/cultures for gut health. It really offsets the orange soup too! Settle down with a nice green smoothie (separate recipe) and your favourite Trail Running Magazine and off you go!